The Toronto Maple Leafs begin training camp in less than a month. With all the changes the Leafs made in the off-season, it will be interesting to see what happens with the lineup in training camp. Will there be any prospects that manage to earn a spot with the team, despite the addition of many UFA stopgaps? Who knows? What we do know is that one position that won’t have much change is the goaltending. The Leafs have two goalies that we know will be on the roster, with three prospects battling for the starting job with the AHL’s Toronto Marlies. Let’s take a look at them. Bernier was given a new two-year deal recently, narrowly avoiding an arbitrator’s ruling. Now that that’s taken care of, Bernier will set his focus on improving his game in his third season with the Leafs. When the Leafs traded for him after the lockout-shortened 2012-13 season, it was expected he would be much better than he has been. 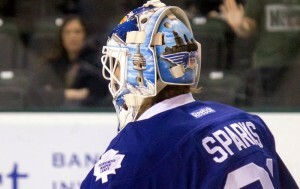 Now perhaps expectations were set too high, but he still needs to show that he can be the Leafs goalie of the future. The unfortunate thing for Bernier is the timing of his new contract. We all know the Leafs are not going to be good this season. So if he wants a long-term deal at the end of his current contract, it’s not very likely to happen. This is all but assured to be Reimer’s last season with the Maple Leafs. In the final year of a two-year deal, the goalie that led the Leafs to their only playoff berth in the past 10 years will once again have to settle for the back-up role. Yet to play more than 37 games in an NHL season, that doesn’t seem likely to change. He has been a good soldier for Toronto, never complaining for his reduced role. He deserves the chance to see if he can be a starter elsewhere. If the Leafs can find a taker, Reimer could be a candidate to be moved at the trade deadline. Gibson was the primary starter for the Marlies last season and even saw time as the Leafs backup at one time last season. A Los Angeles Kings draft pick in 2011, Gibson will have the greatest chance to win the starter’s role with the Marlies. As such, he’s also the goalie most likely to be called up in case one of Bernier or Reimer get injured. Bibeau didn’t exactly have the best season last year, but it was his first pro season after leading the Val d’Or Foreurs to an appearance in the 2014 Memorial Cup Tournament. He still managed to win 15 of his 31 games, not bad for an AHL rookie. Whether he will be the backup for the Marlies or the starter for the ECHL’s Orlando Solar Bears remains to be seen. The youngest goalie in the Leafs system, it would be nice to see him get some starting time.